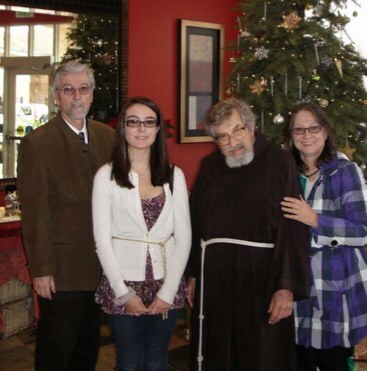 It was Boxing Day of 2010 and our family decided to take up Padre Efrem’s invitation to join him for lunch at his new home at Alma Via in San Francisco. The last two times we met at the events organized by the Trentini nel Mondo club, Padre Efrem expressed his desire to have someone publish the many poems he writes, and since I had just started playing around with creating web sites and blogs, it occurred to me that this might be a good medium for him to have the world read his poems. We will have to visit him again because by the end of our visit a friend had turned up to fix his printer and the poems took the back stage. We spent about three hours together and I went home feeling privileged to have spent some quality time with this great man. Although I can only speak for myself, I think that my husband Tarcisio (who incidentally is the Trentino in the family), and daughter Laura were also very touched by the time we spent with Padre Efrem. I am writing this short article in the hope that many of you will also take the time to visit Padre Efrem (he really does live for visits from his friends) in his new home. When we arrived we went to greet him in his room, number 10. It is a simple room where he has set up a desk with a computer and his books on one side and his musical instruments on the other. His bed serves as a table during the day. We spent a few moments there during which time I scanned through his poems in Italian, while Tarcisio looked at the poems in Trentino and Laura those in English. Some of the poems are quite touching, and all came straight from the heart. Unfortunately we had to leave to go to lunch before it got too late – at which point Padre Efrem picked up the panettone we had brought him and explained that someone had brought it to him today. We explained that it was we who had brought it and then he sadly told us about the problems he is having with short term memory due to his recent illness and that he is starting to worry that he might be in the early stages of Alzheimer. So we headed to the dining hall. I must say that next to the two retirement homes I am familiar with in Trento, Alma Via seems to be a paradise. It is really nice that guests can purchase tickets for lunch and be able to sit down and share a meal with the residents. It all makes assisted living so much more humane.The staff were extremely pleasant and not bothered at all that he had brought in three guests. Well as soon as we had ordered our food, Padre Efrem told us his story, at least the short version of it. It is amazing how the human memory works. Although he had trouble remembering our names his long term memories seem to be quite intact. I promised I would write it all down and share it with others. 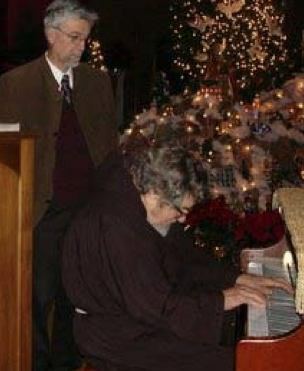 So here I am doing just that; I hope you enjoy reading this as much as I have enjoyed this brief visit with Padre Efrem. Padre Efrem was born on the 17th of May 1921 to Maria Dellagiacoma “Accursio” and Andrea Trettel “Da Molin” in Predazzo, in the province of Trento. His baptism name is Mario Trettel. His mother was a native of Predazzo whilst his father was born in Tesero, only a few miles away. Mario was their second child with his elder sister born in 1919. Andrea Trettel was the son of a school teacher and he himself had also studied to be a teacher but preferred carpentry and had purchased his own workshop to build his life as a carpenter. It was a happy start to life, however life is unpredictable and tragedy soon hit this happy little family when a fire broke out in his workshop and destroyed everything that they owned. Penniless and in debt, the family moved to Caldonazzo where they spent the next three years in a two roomed home while the father was working on getting a full teaching credentials. After three years he got a full time teaching post in Trento and bought a “vecchio mulino”, an old windmill. He was now able to move his family from Caldonazzo to Trento. Moving to Trento and living in a small space, as all the family had to sleep in one room while his father restored the property to a home, Mario went to school there. These were hard times and one day Andrea met up with Mario who was returning home on his bike and asked him if he would go and stay with the Friars. In Padre Efrem’s words, in those days if your father asked you to do something, there really was nothing to do other than say “yes”. So within a matter of days, Mario was taken to the Friars in Vilazzano where he said “bye, bye” to his father and to the life he had known so far. In Caldonazzo he lived with about 60 other kids of whom only 5 or 6 became “frate”. Mario spent one year at Villazano and then went to Campo Maggiore, as he explained that this was towards the Adige going north, he noted that his memory was failing him and could not recall the name of the lake nearby.After three years at the Noviziate, the group of kids was now down to 9. It was war time he recalled, and many had been taken there because their dads had gone to war and there was no one to feed them. The rigors of a friar’s life were not, however, for everyone and most of them dropped out on the way. At this point he gave us more facts, but the sequence was a little hazy. Mario spent 3 years in high school in Rovereto while with the Friars (for those of you not familiar with the area that is 20km south of Trento), he then spent 4 years studying Theology in Trento and at the age of 24, in 1944 he celebrated his first mass. This was the beginning of his new life as a Franciscan missionary and in the Franciscan tradition he changed his name. He was now Padre Efrem. Padre Efrem spent one more year studying theology and then he was ready to take on whatever mission he was going to be sent to. His first year as a priest was spent in Arco, near Riva del Garda and he lived at the Noviziate while he helped out at the Arco parish. This was now the post war period and there were many needs throughout Italy. The Franciscan province, of which he was now a part had a need for someone to teach in Calabria, specifically in Tropea. I digress a moment here as I know Tropea well, having good friends there, this is an incredibly beautiful place with incredible beaches, I dare say that it is close to paradise – but even when I used to visit some 25 years ago there still was a lot of poverty in the area. After an evening out, it was common that a little kid under the age of 10 would ask you for some money because he or she had protected your car! So one can only imagine what this placewhich today lives off tourism was like in the post world war II era. Back to Padre Efrem. As he remembers Tropea, a huge smile appears and he says “bellissimo” (most beautiful) in his own words “Ci’ho ancora il mio cuore a Tropea”. My heart is still in Tropea. While in Tropea he taught at the convent and in his spare time he went to help a priest who had started charitable work they called Susha. He essentially worked the streets of Tropea helping the very poor and destitute. So I asked him why he left. He told me that there was a mission going to China following the assassination of a Franciscan priest there, and his friends and fellow friars from Trento urged him to go with them. He felt obligated to leave. When he left Tropea he remembered that they had to stop the train for about 15 minutes because so many people had turned up to say goodbye and wish him well. He was very sad to leave this beautiful place and these wonderful people. Through my friend Emilio who knows many people in Tropea, I tried to find out if there was anyone who still remembered Padre Trettel in Tropea. Poor Emilio actually went visiting several people until he realized that this would be impossible given the dates we were talking about. Well I thought it would have been nice but realize that I had given him an impossible task! Back in Trento Padre Efrem quickly prepared for their journey to China. This was now around 1948. They set off by sea to New York, then to San Francisco where they stopped for two weeks at the Parish of the Immacolata Concezione which was run by the Trentino branch of the Franciscans. From San Francisco they took a boat to China and went straight to the mission on the Blue River. “Bello” he said as he reminisced on his memories of the journey. They spent 3 to 4 days in Shanghai as guests of the Salesians then took a 5 to 6 day journey on the river till they reached their destination. He spent four years in China, during which time he learnt about the culture and the language. When they arrived there, China was not yet under the communists but the communists did take over while he was there. They came from Manchuria in the north he recalled. They came in and took over the parish. The priests were allowed to carry on for a while but then they put the bishop and jail. While in jail, the bishop sent them a message telling them to leave. So they packed their bags and took a 3 day train ride to get to Hong Kong. From there, they took a plane that took four stops and they eventually landed in Rome from where they took a train back to Trento. Back in Trento the four of them were asked what they wanted to do. Two of them chose to return to the Orient. At this point in his story, Padre Efrem pauses to think of his old friends with whom he had also been to Japan and Korea where they led a church for those sick with leprosy. He spent one week in church with all the lepers and remembers the experience as very enriching and uplifting. Then he spared a thought for Padre Claudio, Padre Michele and Padre Lino who had been in his class at school; they are all gone he said, I am the only one left alive. Padre Efrem came to California in 1954. It was not a 12 hour plane ride to get here though, it took them one month. They set off from Naples by boat to New York where they spent one week. It was a beautiful and memorable journey he recalls with a big smile. Then it took another week across by land to San Francisco where he was to assist Padre Bazzanella. He started teaching. At this time there was a group of Italians who were doing radio in Italian and transmitting from Oakland. One day he was asked to drive a priest over to the recording studio to give a sermon on TV. This is the moment that changed his life. Within weeks of this visit he started his own transmissions. He would prepare the tapes for radio in his room and then send them over to various stations for transmission. He had done radio for 50 years and TV for the last 23 of those years. In San Francisco he was also a parish priest for many years. All the time he built a strong network taking care of making contracts and fundraising by organizing dinners to finance these transmissions. Padre Efrem was transmitting on 20 stations including Mississippi. After he fell down three years ago and the doctors told him he had to stop all these activities he had to terminate all these contracts. It was the hardest thing for him to do. He said that he has sent all his tapes and information about his activities to the museum of Trento. 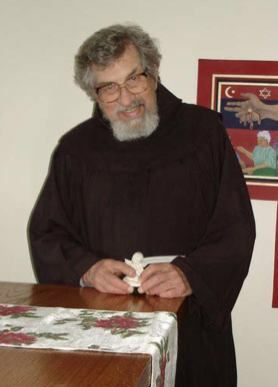 One can only hope that someone there will take the time to record the life of Padre Efrem Trettel and his many achievements and place them in some historic perspective. During his years in San Francisco, Padre Trettel organized several tours to Italy at low cost giving the opportunity to many Italian emigrants to return to their homeland and visit the families that they had left behind so many years earlier. He added that during those visits while everyone went to their home towns to visit with family he took the opportunity to go off to Trento to visit his own family. This of course was a rare treat for him and his family. At this point Padre Trettel exclaimed– that’s my story! I would have thought that we had tired him out, but at 89 he is still very enthusiastic and dynamic. He loves spending time with young people and he stopped to have a chat with my daughter and promised to make a “grop” that is a knot in Trentino, so that he would remember to say a prayer for her on her birthday which was coming up soon. Then he asked her, if she would you like to listen to some Christmas music; that’s more fun than listening to my story, he added! So we decided to head to the church where there is an organ and piano. But before the fun he wanted us to experience the dilemma of the many people suffering from Alzheimer. So first there was one stop. We went to the top floor of the home having to pass through a keycode locked door, to visit the Alzheimer residents and mainly to visit an old Korean priest who has Alzheimer The home has this special section for the elderly who are suffering from Alzheimer – it was a very touching and humbling experience. Padre Efrem is very worried that he may end up in that condition. But I am praying that he will not, his cheerful ways have so much to give the elderly at the home. And up we went for a visit to the church which is just across the street from the home. There was a beautiful crib laid out and we took some pictures. Padre Efrem then headed for the organ, not all the switches were on but he still managed to play some incredible music. He then took a shot at the piano. Wow what a musician he still is. He is quite impressive at the venerable age of 89! Padre Efrem has given his life so that others may have a better one. There are many members in the Trentini club. If each family could spare a few hours one week each year to visit him at Alma Via, then he would not feel cut off and lonely. I guarantee that you will get more out of this visit than you ever expected, I know I did.